I so know what you mean about the overuse of paper towels. I buy mine at either Costco or Sam’s Club because we go through so many of them it would cost Austin’s education to buy them 1 at a time at the local grocery store. Even still, I think I like your idea & I’m going to give it a try too! I’ll keep you posted on how my household survives! I’d love to hear about your “baby bottom cleaning spray.” Why did you decide to use it & how did you come up with the recipe? Will you share it? You made me really start thinking about this and about paper napkins. When I was a kid (way back in the dark ages) my mom put the silverware right on the table without napkins and always had a kitchen towel nearby and while we had a roll of paper towels “hanging” up from the old hanger under the cupboard we tended to use dishrags and dish towels for most things and used old newspapers to clean the windows with white vinegar. 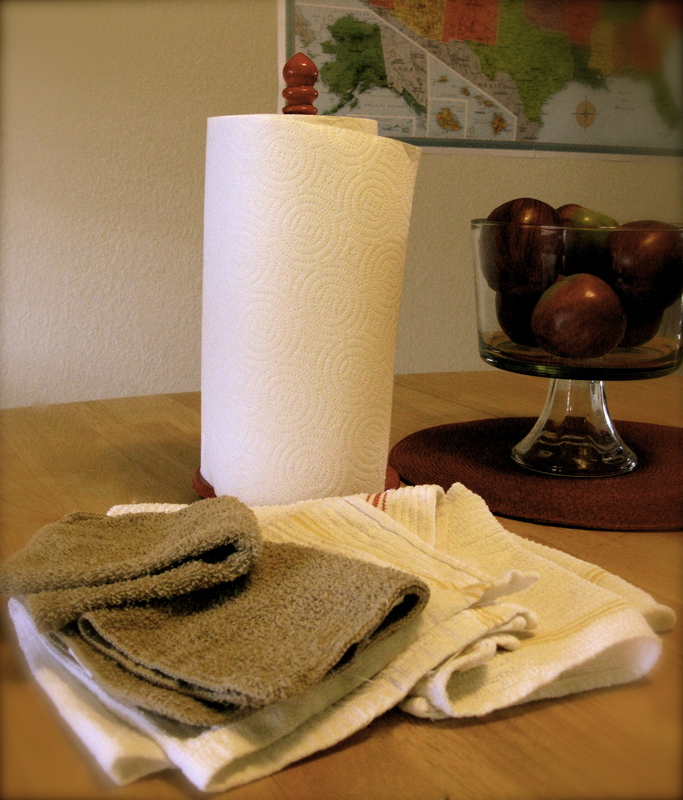 I have to admit that I use paper towels a lot but if I run out, I don’t really miss them…I use dishrags and dish towels just like my mom. Reading your blog brought back some old memories. Now I wish I could just figure out why the heck she always put the turky in the oven at 6:00 am for Thanksgiving dinner. Paper towels are in my home for one purpose: cleaning out the cast iron skillet. I can manage dish towels for all other household tasks, but I haven’t gotten around this one. Any brainstorms? Robin-that’s is a great question! I used to use paper towels on mine too. I found this method over at http://www.thekitchn.com (note that’s not a typo in there!) a while ago and it’s a method I’ve been using. In the their instructions you can use a dry cloth OR paper towels. Hi Tara! I have also been known to go through a ton of paper towels too! I am working on cutting down on those as well as ziploc bags. I found this tutorial on how to make cloth ziploc bags and thought you might be interested? I thought it was clever! Christa-thanks for sharing that! I’ve tried saving the plastic ones to reuse but those look much more fun!